I have been trying for some years now to simplify holiday meals. It’s not that I don’t like putting together huge extravagant spreads for just about any occasion. 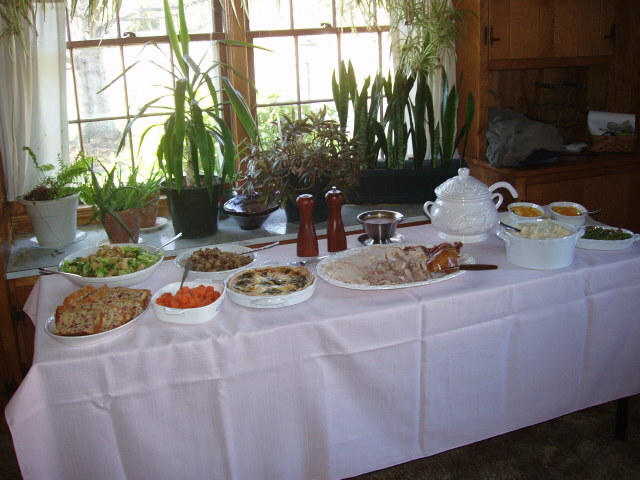 Food-family-fun is genetically programed and was nurtured by year after year of fabulous daylong gatherings. I love spending time with my parents, my siblings, their sweet children, my three darling stooges. It’s just logistically more difficult at this time. This has been developing over several years now. Four years ago I actually canceled Thanksgiving until the kids offered to help out a little. Our simpler menu was actually quite nice. Perhaps I am just running out of steam but I can’t seem to pull even that much together these days. Perhaps I am just not as motivated. So I decided to go a different way. Instead of pulling together these humongous meals several times a year, I am aiming to create a humongous meal over the course of one year. Yeah, that’s more like it. This year Thanksgiving was “Just Desserts.” I made some sweet quick breads earlier in the week (cranberry orange nut being the favorite). First thing that morning I started a yeast dough for donuts. We made pies and cookies and brownies. All day, just desserts. 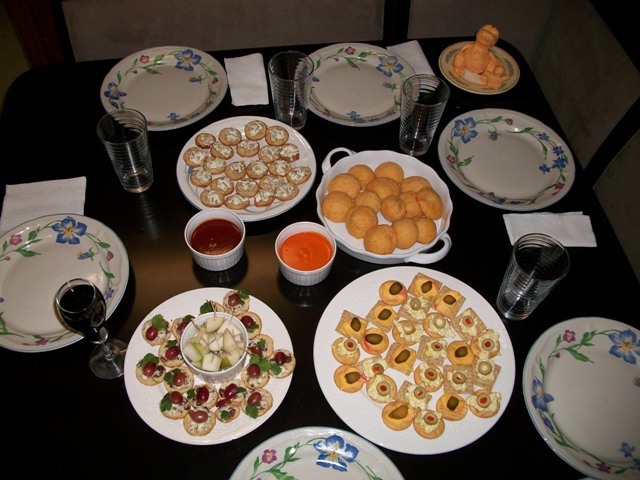 For Christmas I decided to do my favorite part of the holiday meal–All D’Oeuvres. These are all the veggie noms. 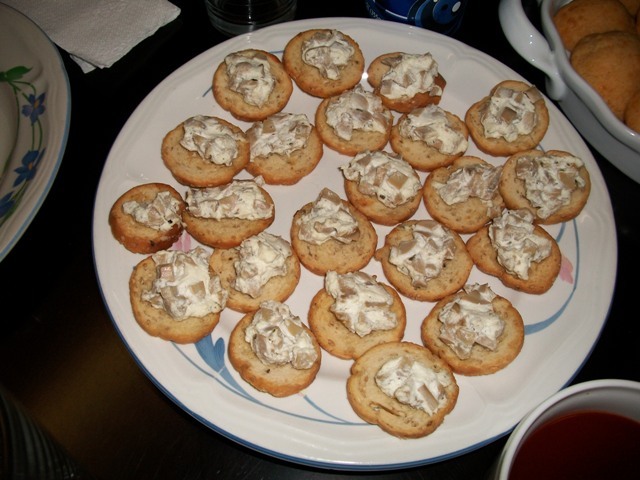 I did make some chicken drumettes for the omnivores but they didn’t make it to the table. 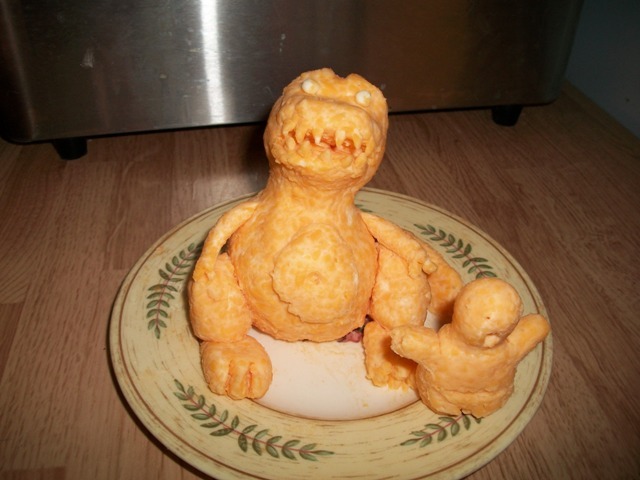 Helen the Cheeseball Master contributed this master creation. Sam immediately took the head off the poor caveman–relieving his terror. We had marinated mushrooms with goat cheese, broiled on sesame melba. 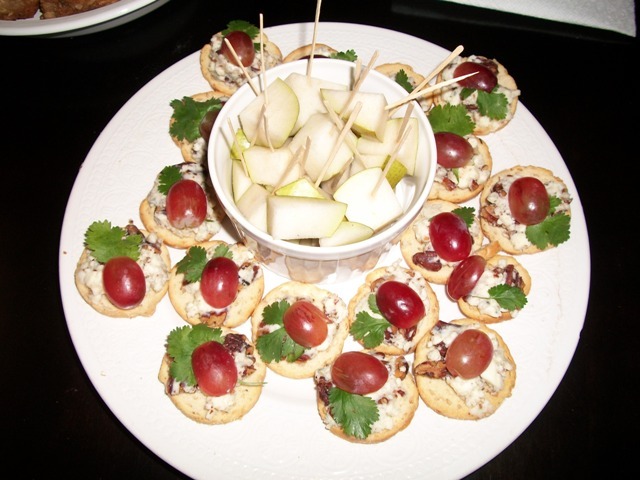 For a bleu Christmas, toasted pecans with bleu cheese topped with seedless red grape halves and a cilantro leaf. 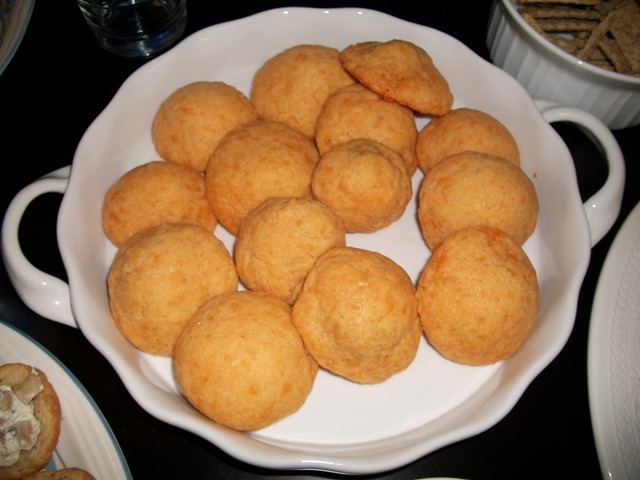 What looks like cookies are actually green olive stuffed cheese puffs. It’s still a lot of cooking and prepping. Clean up was certainly a lot faster. It was not an overwhelming amount of food. I’m kind of a nibbler so the variety was nice. Next holiday? Maybe a soup and salad course. 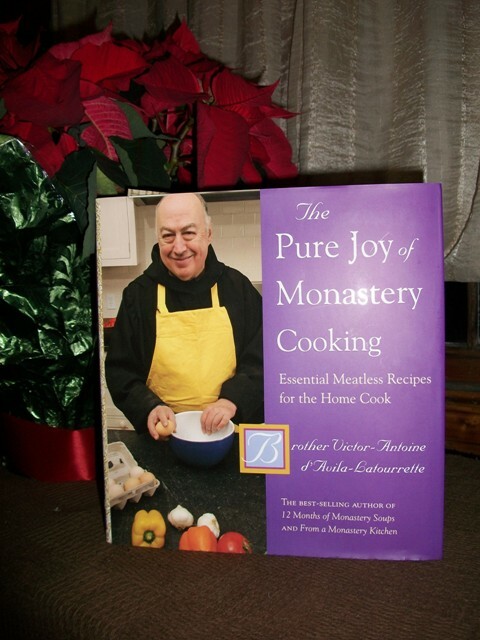 Mom and Dad sent me the most wonderful cookbook, latest in a series put out by the most radical simplicity proponent I’ve ever met. More to come about that. Every other year, the Mrs. and I make the trip back home to partake in my mothers holiday cooking. The alternate years are spent with in-laws. I cannot emphasize how much of an act of love this is, since my mom cannot do justice to any form of meat. In the past, the family has joked about how Mom’s roasts have died twice. Any offers of help, only gets us chased out of “her” kitchen. She comes from a generation of “cooks” that deemed any meat to not be done if ANY juice ran out of it. When gravy is reintroduced, the meat is a faster “Quicker Picker Upper” than what is advertised on TV. I kid you not. Fortunately, mirth and merriment were maintained with liberal doses of my homemade limoncello. So, while I am not a big fan of vegetarian dishes, the pictures you took look a lot better than what I ate this holiday. I hope the omnivores in your family appreciated it. Health and happiness for the upcoming year! Oh, funny. Crunchy standing rib roast. Here’s a recipe for a good southern meat dish. I met a woman who would take T-bones and marinate them all day in beef bullion with a powdered meat tenderizer. Then she’d simmer them in a skillet for thirty or forty minutes. Where I came from we called that stew. And strictly for its digestive and medicinal properties, have another go at the limoncella with a kind wish for your health and happiness as well.